SERIES 8800 HIGH VACUUM HIGH TEMPERATURE HEATER ASSEMBLIES - IVI Corp.
IVI’s heater assemblies are designed for high vacuum high temperature heating of substrates. Specially designed contacts offer extended performance at high temperature. Contacts are evaporative resistive under high temperature operation. Heaters are specially prepared providing clean processing conditions. Heaters are operated from 120 volt power. Heater reflectors are easily cleaned. Convenient mounting facilitates locating in virtually any position. Stainless steel construction for ease of cleaning. Optional quartz cover glasses are available – IVI 8800-1005-0016. 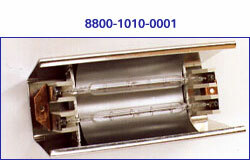 8800-1005-0002 is supplied with a 500 watt quartz lamp. This model may be used in tight places where space is at a premium. 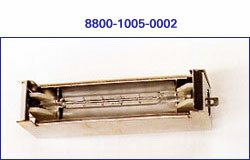 8800-1010-0001 is supplied with (2) 500 watt quartz lamps which provide intense heat transfer.Special assemblies using these lamps have been designed for use in coating and other applications. 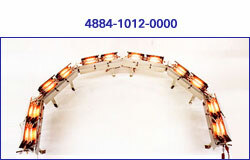 IVI’s 4884-1012-0000 Frontside Heater Assembly including (12) 8800-1010-0001 Heater Lamps. These assemblies are complete bused and are provided with IVI’s 8620-1060-0000 High Current Feedthrough for easy installation into your system.